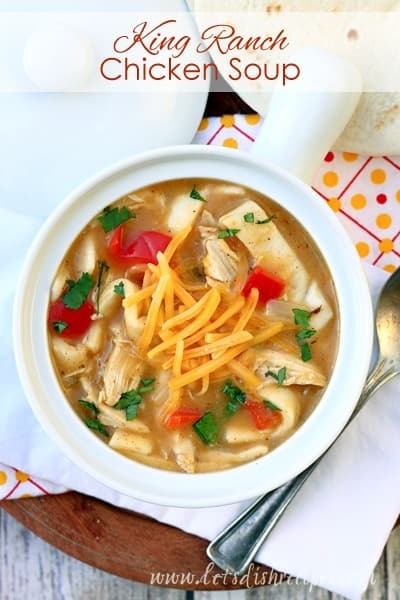 KING RANCH CHICKEN SOUP — This simple, hearty soup is loaded with chicken, cheese, peppers, tortillas and tons of Tex-Mex flavor. I am so glad that soup weather is finally here. First of all, soup is total comfort food, if you ask me. And most soup recipes are pretty quick and easy to put together. Which makes soup a pretty great solution for feeding my family on chilly fall evenings. 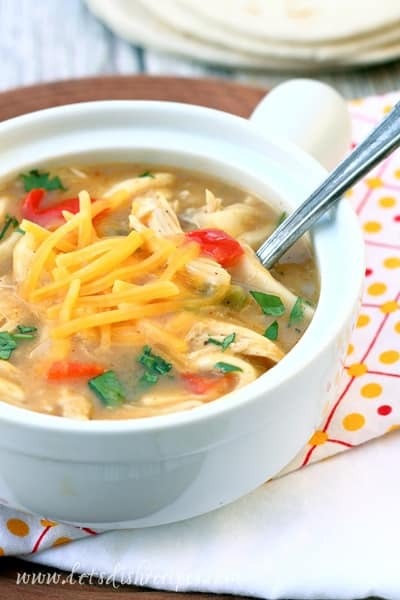 And this King Ranch Chicken Soup is a new favorite at my house. One of the first recipes I shared here at Let’s Dish was King Ranch Chicken Casserole. It’s turned out to be one of my most popular recipes on the blog, even after all these years. Knowing how much I love the casserole, I was pretty sure the soup would be amazing, and I was not disappointed. 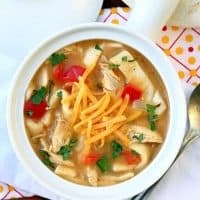 Just think of it as a Tex-Mex style chicken noodle soup, with a bit of a spicy kick, and tortilla strips in place of the noodles. Trust me, it works. And it’s delicious! 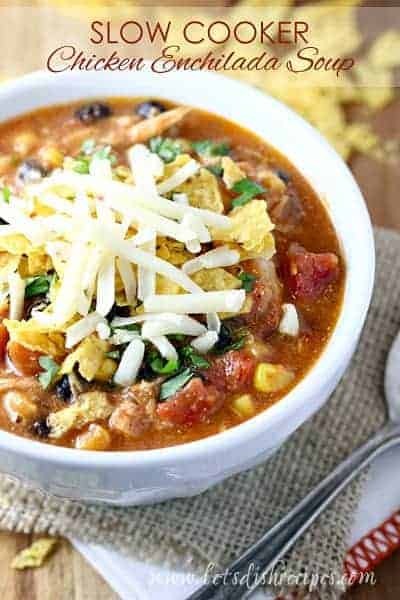 Throw in some bell peppers and a handful of shredded cheddar cheese and you’ve got yourself one satisfying bowl of soup! The original recipe called for canned cream of chicken soup, but I decided to make my own thickened broth instead. Corn tortillas are also totally fine in place of the flour. My family just prefers flour, so that’s what I used. And while I used a supermarket rotisserie chicken for quicker preparation, you could certainly cook and shred your own chicken. 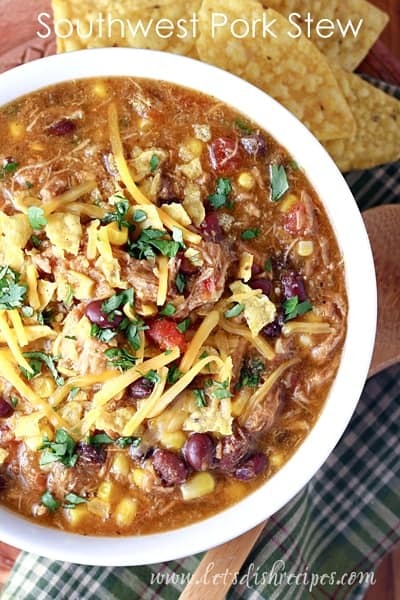 My whole family loved this soup, and my kids happily ate the leftovers for lunch. Not that there were many leftovers. Best of all, it was easy, satisfying and delicious! It just doesn’t get any better than that. 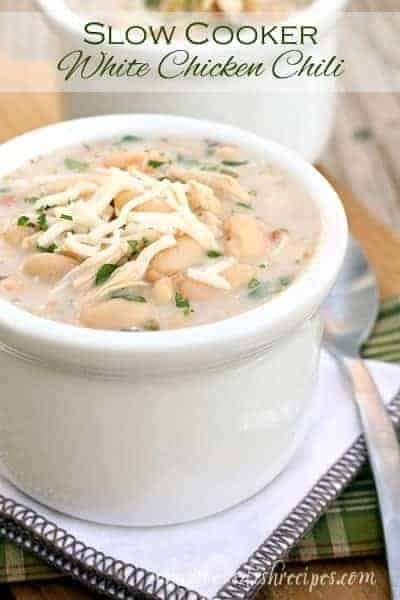 Be sure to save this King Ranch Chicken Soup recipe to your favorite Pinterest board for later. Melt butter in a large Dutch oven over medium heat. Add onions and peppers and garlic. Saute until tender, about 5 minutes. Stir in flour and cook a few minutes more. Gradually whisk in chicken broth and bring to a simmer until mixture begins to thicken. Stir in diced tomatoes and green chiles. Stir in chicken, oregano, cumin and chili powder. Simmer for 5-10 minutes. Season with salt and pepper, to taste. A few minutes before serving, stir in tortilla strips and fresh cilantro. Ladle into bowls and top with shredded cheese.